Hanoi : Vietnamese doctors removed a pair of scissors lodged in a man’s stomach for 18 years, authorities said. 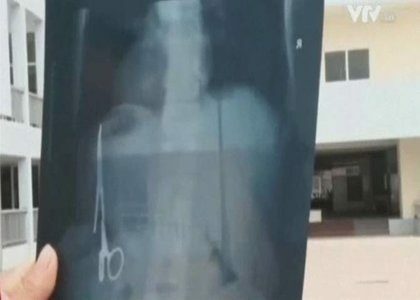 The Vietnamese man was completely oblivious to the scissors until December, when he suffered a road accident and was given an x-ray which revealed their presence, Efe news agency reported. Doctors retrieved the rusty 15 centimetre (6 inches) long scissors from his stomach on Saturday at a hospital in Thai Nguyen province, northern Vietnam, in a three-hour surgery. The scissors were broken and found on the left side of his torso, showed the reports. The patient, 54, had never felt any discomfort due to the scissors, which had been left inside him when he underwent an operation at the Bac Kan General Hospital in June 1998, said the doctors. The Ministry of Health has ordered an investigation into the case.